When the discount online retailer Hollar announced in December that it was migrating its warehouse from California to Ohio in a bid to trim shipping and logistics costs, observers may have thought the move would hobble the firm's operations during the critical peak holiday shopping season. However, on Jan. 7, Hollar announced that its fulfillment operations were already up and running at the new location, giving credit to its fleet of 80 mobile robots from inVia Robotics. Even while Hollar managers were still recruiting new warehouse staff, their new DC was operational and busy shipping orders of everything from toys and electronics to home, beauty, and apparel items, the company said. The inVia Picker bots used in Hollar's fulfillment center streamline operations by enabling a goods-to-person workflow, operating alongside the facility's human workers to pick and move items, automating the fulfillment process, the company says. InVia's system uses autonomous mobile robots (AMRs) that can navigate through DCs, pick boxes off shelves, and transport them to new locations. Together, the fleet's bots function as a kind of rolling automated storage and retrieval system (AS/RS), freeing up human workers to perform complex tasks like piece picking and quality control instead of walking long distances through cavernous DCs. InVia Picker bots operate alongside human workers to pick and move items, freeing up people to perform complex tasks like piece picking. By lightening the load on their human co-workers, "collaborative robots" or cobots can bring about enormous efficiency gains, manufacturers say. For instance, Hollar reports that its initial deployment of inVia robots at its California warehouse last year boosted productivity 300 percent. So does this mean that warehouses have relegated human workers to replacing robots' spent batteries and squeaky wheels, or that they've even dispensed with humans altogether? Not at all, the experts say. 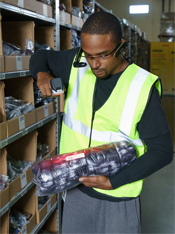 While the new technology, whether it's an AMR, a cobot, or an automated guided vehicle (AGV), may be providing warehouse workers with a valuable assist in certain tasks, fulfillment centers will continue to employ large staffs of human labor for the foreseeable future, doing roughly the same work they're doing now. When robots doing the traveling, workers don't get as tired, so they're more actively engaged, and more productive, too, says Tim Sprosty of DHL Supply Chain..
To understand just how robots can ease the physical burdens of warehouse work, you need look no farther than the operations run by DHL Supply Chain, the contract logistics arm of German logistics giant Deutsche Post DHL Group. The company, which is known for its pioneering work in applying emerging technologies, has conducted a number of pilots with robots in recent years. 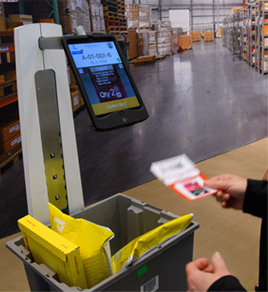 DHL does not provide details on the specific robot models involved, but in the past, it has said it used technology from the former Rethink Robotics—which provided stationary piece-picking arms capable of sorting each-picks—and from Locus Robotics, which makes autonomous mobile robots that carry bins of goods and tablet computers, accompanying and instructing human pickers and then delivering the selected goods to the next station. To date, the greatest impact of robots on logistics work has been to supercharge human workers by taking on some of their more onerous assignments. For example, robots often do the heavy lifting on the warehouse floor, so human workers no longer spend their days pulling a pallet jack, climbing off a forklift, or physically handling items, says Tim Sprosty, senior vice president for human resources at DHL Supply Chain. "Associates were walking six, seven, eight miles a day as they traveled up and down the aisles," Sprosty says. "Now, there isn't the fatigue, because a robot is doing the traveling for the associate, so people don't get as tired, they're more actively engaged, and they're more productive as well." In fact, their productivity may rise to the point that companies need to adjust their labor standards, he adds. Reducing the physical demands of warehouse work has also made it easier for employers to find workers, according to DHL. "Many warehouses have [jobs] to be filled, but not enough applicants, so there's a war for talent at the warehouse level," Sprosty says. "That is why DHL has invested time and energy in making the work easier; it helps with recruiting, not just with training and onboarding." The typical DC worker on the floor won't need additional technology skills or robotics expertise to work with cobots, says DHL Supply Chain North America CIO Sally Miller. As robotics continue to change the nature of warehouse work, it might seem inevitable that job requirements for workers would change as well. But companies that have used the cobots say no technical wizardry is required. The typical hourly worker on the floor won't need any additional technology skills or robotics expertise, according to Sally Miller, chief information officer (CIO) for DHL Supply Chain North America. In fact, many floor workers are comfortable with basic cobot technology without specific training—thanks to their use of consumer electronics like tablets and smartphones, she says. "We're seeing that with our associates about 40 years old and younger, who have grown up around technology—they understand it very fast." And if those associates do encounter problems, DHL has a plan in place. 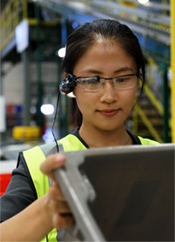 As workers become more proficient at working alongside robots, DHL certifies its most technologically adept employees as "warehouse super-users," a role that requires them to provide the first line of tech support and answer colleagues' questions about everything from cobots to warehouse management system (WMS) software, Miller says. While the introduction of robots may not demand much in the way of new skills for DC laborers, it could have a slightly bigger impact on their bosses. "The managers will have to understand how the technology works; they will have to be more tech-adept than they were in the past," Miller says. Even so, the impact on managers will likely be only moderate, according to DHL. A few technicians may be needed to perform preventive maintenance, but serious repairs or software upgrades are typically handled by the robot vendors themselves, the company says. Robots may reduce the number of people needed at DHL Supply Chain, but there will still be a need for uniquely human skills like dexterity and decision-making, says Miller. Given the advances in robotics capabilities over the past few years, some may wonder whether the bots will soon be putting humans in the unemployment line. At DHL, at least, the answer is a firm no. While the company acknowledges that over time, its fleet of warehouse robots may reduce the number of humans needed, it emphasizes that there will still be a need for uniquely human skills like dexterity and decision-making. Although the cobots have proved quite effective at enhancing workers' productivity, they still rely on humans for tasks like physically reaching into a bin of products and pulling out individual units, Miller points out. "We are deploying cobots, but it's a misconception that they're going to one hundred percent replace what human employees do," Miller says. "Bots are used to reduce the travel time of associates, which will reduce the number of associates in the building, but not a hundred percent. The feedback is that [workers] like working with the bots and will be able to be more efficient and to level-load their work activity." Feedback: What did you think of this article? We'd like to hear from you. DC VELOCITY is committed to accuracy and clarity in the delivery of important and useful logistics and supply chain news and information. If you find anything in DC VELOCITY you feel is inaccurate or warrants further explanation, please ?Subject=Feedback - : Robots that can go the distance (and carry that weight)">contact Chief Editor David Maloney. All comments are eligible for publication in the letters section of DC VELOCITY magazine. Please include you name and the name of the company or organization your work for.